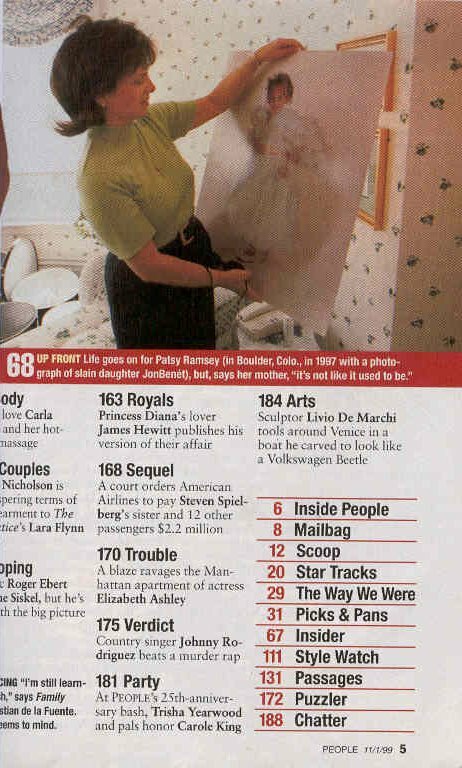 "Good Housekeeping Magazine, February 1999 "PRETTY BABIES"
"It was in this hotel, in Atlanta, that Thumper Gosney met JonBenet Ramsey, five months before the pretty blond 6-year-old was found murdered in the basement of her Boulder, CO, home on December 26, 1996. The girls were competing in the same age group at the Sunburst International Pageant, though JonBenet was something of a novice, having competed only in local Colorado contests." 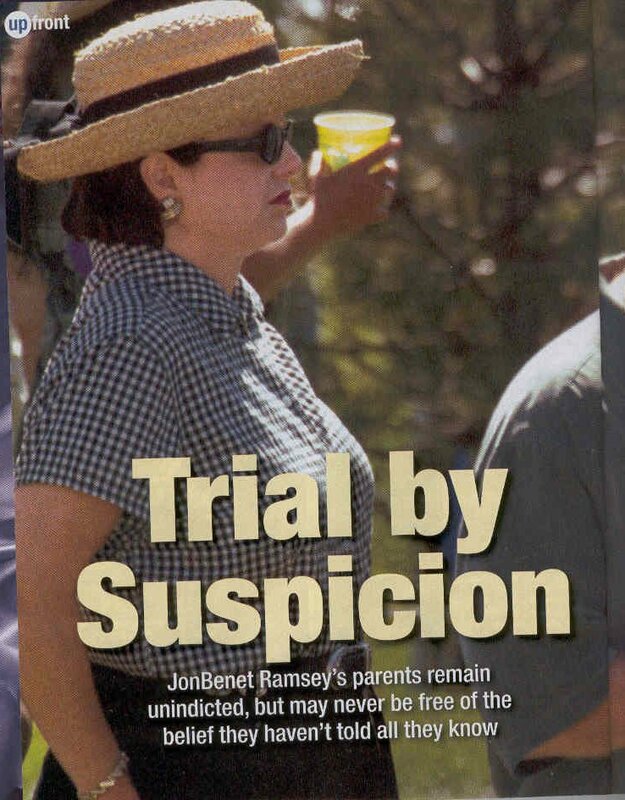 Susan first noticed JonBenet in the pageant book. "When you get to a pageant, you look to see who your competition is," Susan says. "I remember saying, 'That's one beautiful child.' So many kids look like cookie-cutter cutouts. Their families hire the same hair and makeup people. But she was naturally gorgeous And she was brand-new." "JonBenet was transfixed by Thumper's talent routine, Susan remembers, a rendition of a Patsy Cline number entitled "She's Got You." Playing a scorned girlfriend, Thumper yanked various objects including love letters, records, even a pair of junior golf clubs -out of her evening gown. "JonBenet wanted to know how she got all that stuff in her dress," says Susan." "Thumper and JonBenet became friends and played together. The Gosneys found JonBenet to be sweet, quiet, and unaffected. Patsy Ramsey, her mother, though mostly friendly, at one point became standoffish. The Gosneys were intrigued by JonBenet's black-and-white costumes (most pageant dresses are in vibrant colors), and asked Patsy about her dressmaker. "She gave short answers," Susan recalls, ''as if we were trying to steal her ideas" When JonBenet died, the Gosneys were stunned. Thumper sent flowers to her little friend's funeral. And then everything began to change." "Pageant outfits are frequently resold and refitted. Although Thumper's Western Wear costume originally Cost $2,200, Susan picked it up from another pageant mother for much less." "People sell their clothes because their children have outgrown them, or they want a new look," says Faye DeMatteo. Some mothers think that buying a dress from a winner will help their own child's chances." "JonBenet's mother, Patsy Ramsey, was in the market for some custom made costumes at a local pageant called Dream Star held in Rome, GA, over Thanksgiving weekend 1996. After striking up a conversation with Faye in a restaurant, Patsy asked about the outfits she was selling. Patsy ended up buying Rayanna's fancy white pageant dress, made of silk organza. 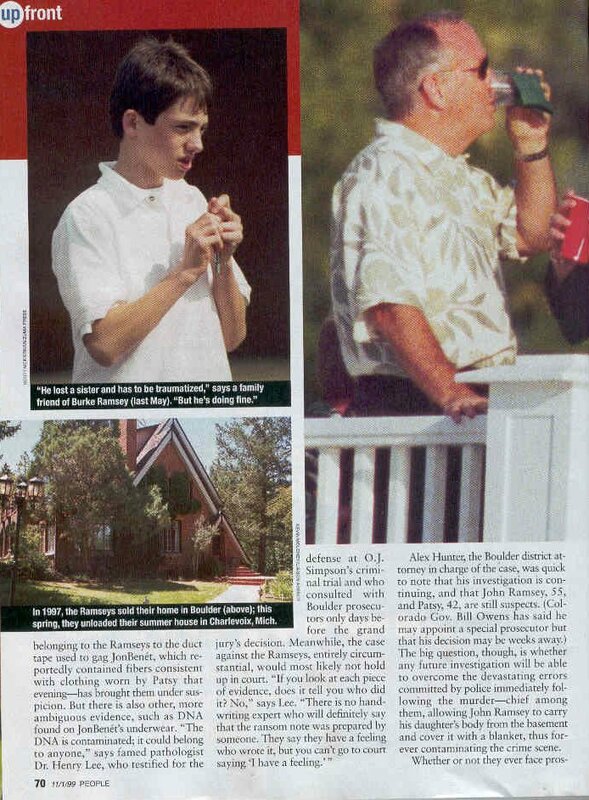 One month later, JonBenet was buried in it." "The DeMatteos went to the funeral. 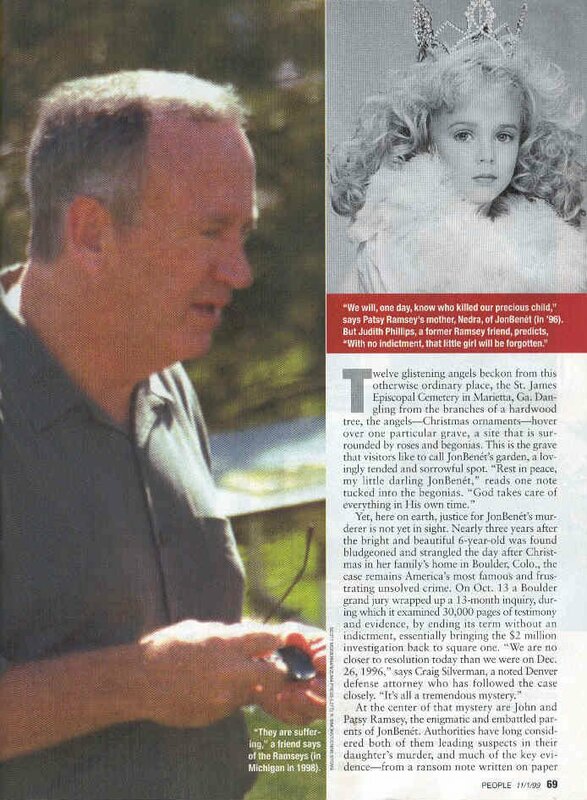 "All the girls in JonBenet's group from Dream Star bought an enteral light for her grave," says Faye." 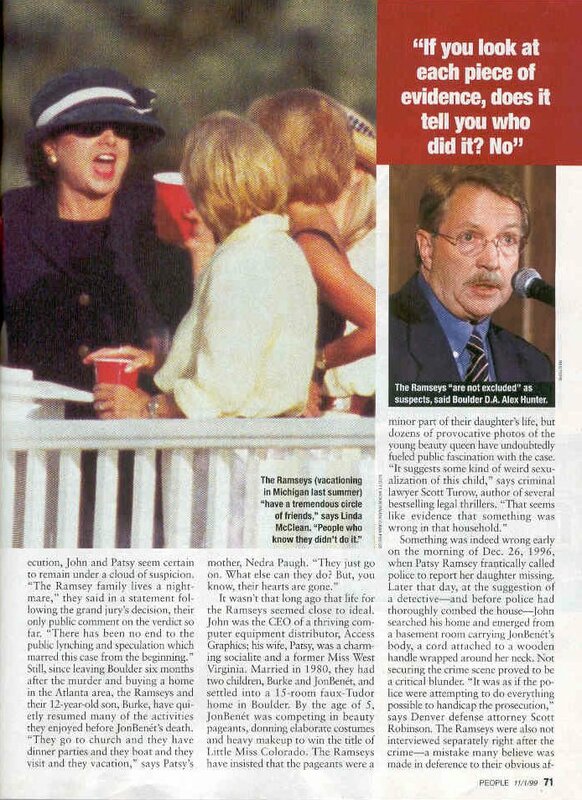 (Page 5): PHOTO CAPTION reads, "Life goes on for Patsy Ramsey (in Boulder, Colo., in 1997 with photograph of slain daughter JonBenet), but, says her mother, "It's not like it used to be." (Page 70): "But there is also other, more ambiguous evidence, such as DNA found on JonBenet's underwear. "The DNA is contaminated; it could belong to anyone," says famed pathologist Dr. Henry Lee, who testified for the defense at O.J. Simpson's criminal trial and who consulted with Boulder prosecutors only days before the grand jury's decision." (Page 71): "The Ramseys 'are not excluded' as suspects," said Boulder DA Alex Hunter. 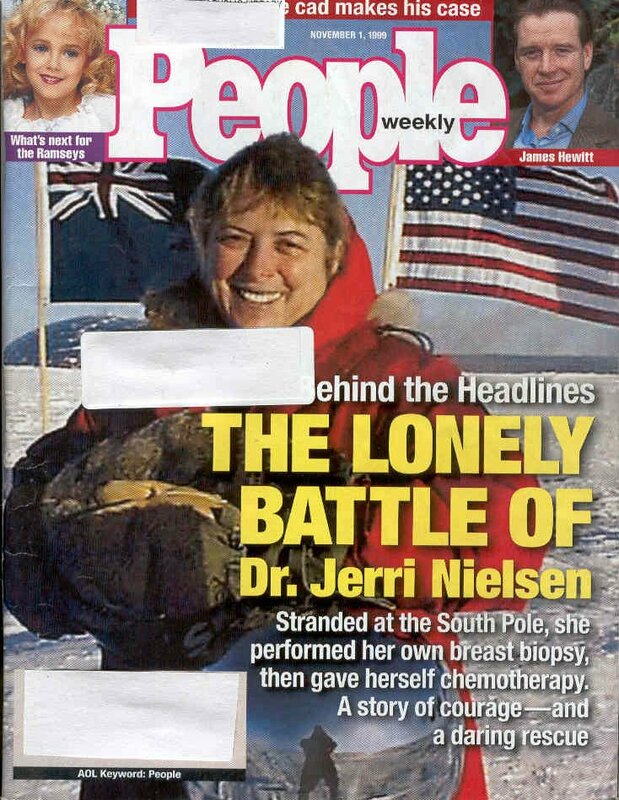 (Page 72): "Their friends say they have remained generally upbeat. "Burke is always arund, so they can't have their jaws on the ground all the time," says Patsy's close friend Linda McLean. "there's this young boy who has a life to live." Burke, 9 years old at the time of the murder, is now a seventh-grader in an exclusinve private school in Atlanta. "He's like all 12-year-olds," says his grandmother Nedra. "He has a laptop, one of the very best money can buy, and he wants to be on that computer all the time. He's an excellent student." "Not long ago, Patsy--who was stricken with ovarian cancer in 1993 and is now in remisison--began joining her husband on golf outings and is starting to socialize agtain within her tight-knit circle of friends. "Having to be a recluse must be terrible torture for her because she loves people," says Diane Barnett Lough, a childhood friend of Patsy's. "She was always that way." "The Ramseys, who have been staying in the Atlanta area while thier cream-colored brick mansion in the same city is renovated, regularly attend services at the Evangelical Anglican Church of the Apostles. This summer, the family stayed with friends in Charlevoix, a picturesque resort community on the top of Michigan's Lower Peninsula where they once owned a summer home. There the Ramsey went to weddings, shopped in town and stolled through fairs. "I would say they were subdued but normal," says their friend Pat Gaskin."